Portrait of Claudio Monteverdi in Venice, 1640, by Bernardo Strozzi. Claudio Monteverdi (May 15, 1567 (baptised) – November 29, 1643) was an Italian composer, violinist, and singer considered a crucial figure in the history of music. His work bridged the "old practice" and the "new practice" and, thus, enabled the transition from Renaissance to Baroque music. During his long life, he produced eight books of madrigals and forty operas, which can be classified in both old and new categories, and he was well versed in both. Having taken over opera from the Florentine "camerata" and introduced the Baroque method of declamation with continuo accompaniment, he enriched it with an unprecedented expressiveness, and moved from the Renaissance ensemble of diverse instruments in La Favola d'Orfeo, to an early version of the Baroque ensemble, where specific categories of instruments were used for mood painting. Monteverdi was one of the most significant innovators that brought about the change in style. His later madrigals were revolutionary in that they were arranged in parts for voices or instruments (concerted style); La Favola d'Orfeo is considered the earliest dramatically viable opera. Fortunate enough to enjoy fame during his lifetime, Monteverdi's personal life was marked by a short duration of happiness in love, both as a child and husband, through having experienced the tragedies of both his mother and his wife dying at young ages. Claudio Monteverdi ("Monteverdi" meaning "green mountain" in Italian) was born in Cremona in northern Italy. His mother, Maddalena, died when he was nine years old. His father then took a second wife, who died when Monteverdi was 16. The following year his father married for the third time. Monteverdi's father was a chemist who actually practiced medicine secretly in an age when it was considered an illegal activity (at that time medicine was an illegal act usually undertaken surreptitiously from small shops or stalls). Soon after his third marriage, the authorities finally endorsed his medical work. As a child, he served as a chorister and studied music under Marc Antonio Ingegneri, who was maestro di cappella at the cathedral in Cremona. Since there is no record of him singing in the cathedral choir, the music lessons are assumed to have been private. A child prodigy, Monteverdi produced his first music for publication—some motets (a polyphonic composition usually in three parts, each sung at a different speed and using different words) and sacred madrigals—the major genre of Italian secular music in the sixteenth century, around the age of fifteen. At the age of twenty, he composed his first book of secular madrigals, and shortly thereafter began to seek work outside of his native town. A job offer came in 1590 from the court of Duke Vincenzo I of Gonzaga in Mantua, where Monteverdi began working as a vocalist and viola player, and by 1602, he was promoted to conductor. The Gonzaga family was under the musical guidance of a Flemish composer, and Monteverdi soon became recognized to the point that he was made part of the Duke’s traveling court on his military expeditions in Europe, which brought the composer to the regions of the Danube River and to Flanders. Monteverdi married the court singer Claudia de Cattaneis in 1599, and had two sons, Francesco (Baldassare) (bapt. Aug. 27, 1601) and Massimiliano (Giacomo) (bapt. May 10, 1604), as well as a daughter, Leonora (Carulla), who died in infancy. Until his fortieth birthday, Monteverdi focused on madrigals, composing nine books of them. The Quinto Libro (Fifth Book), published in 1605, was at the heart of the controversy between Monteverdi and the famous reactionary in musical history, Giovanni Artusi, where the latter attacked the "crudities" and "license" of the modern style of composing, centering his attacks on madrigals (including Cruda Amarilli) from the fourth book. Monteverdi made his reply in the introduction to the fifth book, with a proposal of the division of musical practice into two streams: What he called "prima pratica," and "seconda pratica." "Prima pratica" stands for the previous polyphonic ideal of the sixteenth century, with flowing strict counterpoint, prepared consonance and dissonance, and equality of voices; "seconda pratica" is based on a much freer counterpoint with an increasing hierarchy of voices, emphasizing soprano and bass. This represented an unconscious move toward the new style of monody. The introduction of a continuo instrumental part in many of the madrigals of the fifth book is a further self-consciously modern feature. In addition, this book showed the beginnings of conscious functional tonality. The Ottavo Libro (Eighth Book), published in 1638, includes Madrigali dei guerrieri ed amorosi which many consider to be the perfection of the madrigal form. As a whole, the first eight books of madrigals show the enormous development from the Renaissance polyphonic music to the monodic style, with its emphasis on clear melodic lines, intelligible text and placid accompanying music, which is typical of Baroque Music, defined roughly as that written and popularized between the years 1600 and 1750. The ninth book of madrigals, published posthumously in 1651, contains lighter pieces, such as canzonettas, probably composed throughout his lifetime and representing both styles. Opera was a natural transition from monody (solo singing), especially for the dramatically inclined composer who also loved grand effect. In 1607, Monteverdi composed his first opera, La Favola d'Orfeo (or The Fable of Orpheus). It was common at that time for composers to create works on demand for special occasions, and this piece was meant to add some luster to the annual carnival of Mantua. Not only was it a great success, capturing eloquently the spirit of the times, but it coined a new style of music, the "dramma per musica" (musical drama). This is why Monteverdi’s operas are usually labeled "pre-Baroque" or "early-Baroque." La Favola d'Orfeo is marked by its dramatic power and lively orchestration, and is arguably the first example of a composer assigning specific instruments to parts. The orchestra numbered approximately forty instruments, never used all at one time. In many places he specified which musical instruments were to play. This was also one of the first large compositions in which the exact instrumentation of the premiere has been passed down through the years. The score includes an introductory "toccata" (a short fanfare-like movement twice repeated). The plot is described in vivid musical pictures, and the melodies are linear and clear. The title did not include the name of Eurydice, something that most composers that came after him did in keeping with the Orpheus legend. Eurydice in Monteverdi’s rendition is merely a secondary character. His next opera, L'Arianna, followed in 1608, but only a few fragments and one number, the "Lament" (Lamento), have been preserved. The "Lament," written in a recitative style, was admired in the seventeenth century as a foremost example of expressive monody, and when sung well, it moved the audience to tears. Monteverdi later arranged it as a five-part madrigal and afterwards reworked the original version into a sacred text. Vespro della Beata Vergine 1610, (The Vespers of the Blessed Virgin 1610) is lauded as Monteverdi's greatest piece. This was one of his few sacred works of any scale, but it remains to this day one of the best examples of devotional music, matched only by works such as Palestrina's Missa Papae Marcelli, George Frideric Handel's Messiah, and Johann Sebastian Bach's St. Matthew Passion. The scope of the work as a whole is breathtaking—each of the 25 parts is fully developed in both a musical and dramatic sense, using instrumental textures to express dramatic and emotional effect in an unprecedented manner. The Vespers are also one of the best examples of early repetition and contrast, with many of the parts having a clear ritornello (an additional pair of lines following the end of the stanza). The ritornello was something entirely new to the public of the time and became an immediate sensation. During the second half of sixteenth century, many musicians and poets met in the homes of two Florentine nobles, Giovanni de Bardi and Jacopo Corsi, and were nicknamed the "camerata," meaning club, or coterie. There were no opera houses at that time. The artists strove to revive the old Greek tragedies and perform them as closely as possible to the original style. They knew that choruses had been sung but not what type of music the Greeks had employed. They were assisted by Jacopo Peri, whose Dafne (1597) is considered the first opera, although it did not survive. Peri designed a framework that allowed for a "speech-song," an intermediate between the continuous change of pitch in speech and the motion in song, that answered to the demands of dramatic poetry. The ‘camerata’s influence is discernible in Monteverdi’s work. Monteverdi took this rudimentary approach and turned it on its head with, arguably, the first true opera, “L’Orfeo.” His revolutionary debut defied all existing musical convention. In the early seventeenth century, various styles of monody made their way into both secular and sacred music. Monody made musical theater possible, being a medium that could convey both dialogue and dramatic expression in music. 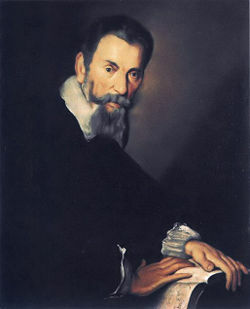 In 1613, Monteverdi was appointed to the position of conductor at San Marco in Venice (San Marco di Venezia), where he soon restored the musical standards of both the choir and instrumentalists, which had withered under the financial mismanagement of his predecessor, Giulio Cesare Martinengo. The managers of the basilica were relieved to have such a distinguished musician to take the post, where music had been in decline since the death of one of his predecessors, Giovanni Croce, in 1609. While in Venice, Monteverdi also finished his sixth, seventh and eighth books of madrigals. The eighth is the largest, containing works written over a thirty-year period, including the dramatic scene "Tancredi e Clorinda" (1624), in which the orchestra and voices form two separate entities, acting as counterparts. It is likely that Monteverdi was inspired to try this arrangement because of the two opposite balconies in San Marco, which had inspired much similar music from local composers, for example, Gabrieli. This composition marked the first use of string "tremolo" (fast repetition of the same tone) and "pizzicato" (plucking strings with fingers) for special effect in dramatic scenes. After his wife’s death, Monteverdi, suffering from poverty, overwork and illness, took holy orders and was ordained a Catholic priest in 1632. Some sources attribute this step to the outbreak of plague the preceding year, from which he emerged unharmed. He would have probably drifted from public attention had it not been for the opening in Venice of the first public opera house in 1637, which sparked his interest in this genre once again. Thus, towards the end of his life, he composed his first opera in almost a decade, Adone. The two last works were opera Il ritorno d'Ulisse in patria (The Return of Ulysses), and the historic opera L'incoronazione di Poppea (The Coronation of Poppea), based on the life of the Roman emperor Nero. L'incoronazione, especially, is considered a culminating point of Monteverdi's work and an operatic masterpiece. It is distinguished by tragic, romantic, and comic scenes, which were a novel element in opera, a more realistic portrayal of the characters, passions, and a warmer melody than was characteristic of the period. It required a smaller orchestra and had a less prominent role for the choir. It further developed the techniques used in La Favola d'Orfeo and featured characters that were recognizably human rather than symbolic. Monteverdi died in Venice and was buried in a vast Gothic basilica, the Frari, in a tomb at the center of the church near the Venetian painter Titian. Throughout the seventeenth century, two distinct approaches, "stile antico" (old style), exemplified by Palestrina, and "stile moderno" (modern style), were clashing. However, Monteverdi wrote in both with equal mastery. He lived and worked in a period of change, as the late Renaissance was giving way to the Baroque, and encouraged this transition by developing and transforming every aspect of music he came into contact with. He was the first composer who wrote operas fully aware of the artistic potential of this musico-dramatic genre, which a modern audience can listen to with appreciation. He took the primitive means devised by the "camerata" and Peri and enriched them with imagination, dramatic force, and creative richness. He transformed "stile rappresentative," or recitative, into rich, fluid, and varied melody with a longer line and more continuity. Compared to the archaic vocabulary and methods of Peri, which could hardly be revolutionized, his operas represented a new art. He used rhythm, discords, instrumental colors, and key changes to project dramatic action, interpret characters or project moods and emotions in a way unknown before or during his time. He devised instrumental techniques to create the kind of agitation, passion or emotional intensity ("stile concitato") his dramas needed, such as pizzicato and tremolo. He was the first to grasp the role of the orchestra in an opera, realizing that wind instruments and percussion were good for projecting military moods, flutes for pastoral scenes, and violas and lutes for sentimental episodes. No composer before him had used these tools for mood painting and characterization, thus, he came to be known as "opera’s prophet" (Hale Publishing, 1966, 36). In madrigals, Monteverdi introduced instrumental accompaniments and exploited to the full the dramatic possibilities of the medium. He employed music as an integral feature of the work, rather than mere decoration. Monteverdi proved to be an inventor and a daring composer. His music followed modern trends, and, like his colleague in Venice, Dario Castello, he followed an inventive approach to music composition. While his inventions and treatment of harmony and counterpoint were accepted and even praised by the public, he was not always complimented for them by his colleagues. Known as having a strong and exciting temperament, having “fire in his blood,” his music, full of excitement, lavishing harmonies, and exuberant tempos reflected such. Considered a "modern" composer, at the same time he knew how to “pay respect” to the older generation and their traditional principles. He published two completely different pieces in the same collection—Missa in illo tempore and Vespro della Beata Vergine, proving himself once again to be the "true maestro"—the master—of music, by utilizing a combination of vastly different styles and employing his wizardry in unifying them, while still maintaining their individual characteristics. So many ideas combined harmoniously together could be done only by a genius such as he – a person of daring and vision. ↑ Stanley, Classical Music: An Introduction to Classical Music Through the Great Composers and Their Masterworks (1994). ↑ Chris Whent, Here of a Sunday Morning. Retrieved February 21, 2008. ↑ Jan Swafford, National Public Radio. Retrieved February 21, 2008. ↑ Predrag Gosta Gosta, Georgia State University Site. Retrieved February 21, 2008. Grout, Jay Grout and Claude V. Palisca. A History of Western Music. New York: Norton, 1988. Free scores by Claudio Monteverdi in the Werner Icking Music Archive. Milestones of the Millennium National Public Radio. This page was last modified on 24 February 2017, at 22:16.